Dozens of Coptic Christian families in Egypt have fled North Sinai province after a number of killings in recent weeks by suspected Islamist militants. Many have now taken refuge in the Evangelical Church in the Suez Canal city of Ismailiya. The Coptic Church has condemned the attacks, saying they were aimed at "dividing" Egyptians. On Sunday, Islamic State militants released a video, warning of more attacks on Egypt's Christian minority. The Copts - who make up about 10% of the country's 90 million population - have often been targeted by Islamists in recent years. Most of the Islamist militant attacks of recent years have been focused on the Sinai peninsula, where an IS-linked jihadist group is active, but the capital Cairo has also suffered a string of attacks in the past two years. 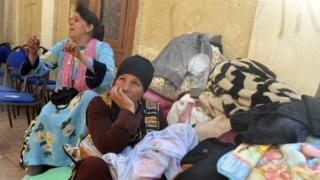 About 250 Christians with their belongings were now in Ismailiya's church, deacon Nabil Shukrallah said on Friday. "They've come running with their children. It's a very difficult situation. We're expecting 50 or 60 more," he told the AFP news agency. Meanwhile, refugees said they were now "scared of our shadows", adding that they "are being targeted in an ugly way". Many of them were from the city of El-Arish, where at least seven Christians have been killed. Egypt has seen a wave of attacks by militants since 2013 when the military overthrew President Mohammed Morsi, an elected leader who hailed from the Muslim Brotherhood, and launched a crackdown against Islamists. Some of Mr Morsi's supporters blamed Christians for supporting the overthrow. In December, a bomb explosion in the Coptic Christian cathedral in killed at least 25 people.